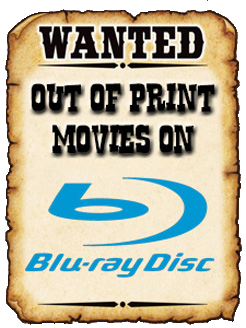 THE B-MOVIE NEWS VAULT: FRIGHT-RAGS' June Prevues of Coming Attractions (UPDATED)! FRIGHT-RAGS' June Prevues of Coming Attractions (UPDATED)! Fright-Rags is kicking off the Summer in style with a variety of new tees and enamel pins celebrating slasher icons, THE TEXAS CHAINSAW MASSACRE, AN AMERICAN WEREWOLF IN LONDON, and the totally awesome CABIN IN THE WOODS! 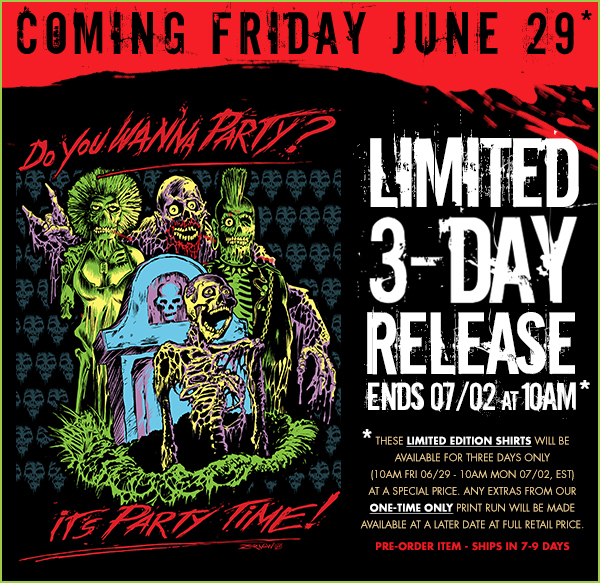 Plus they are bringing two more "Classick" t-shirt designs back from the dead for three days only! Let's scope it all out, shall we?! 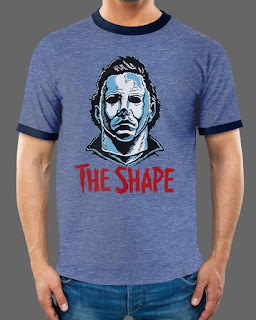 A new collection of tees that give some of your fave Horror icons a super retro feel! Choose from Ghostface, Leatherface, Michael Myers, or Pinhead! Shirts come in all sizes and are $27 for plain black or white tees, and $29 for the beauties featured below! CLICK HERE to snag one (or all) of them now! 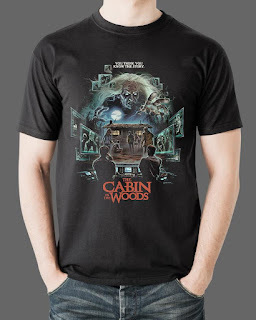 THE CABIN IN THE WOODS instantly became one of my favorite modern Horror films, and I'm super happy to see Fright-Rags putting out some real quality tees in celebration of this genre-deconstructing flick! 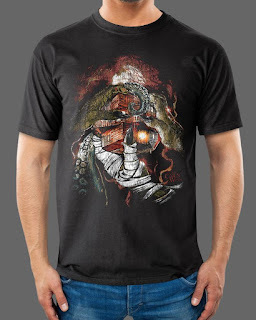 There are three distinctly different designs available (I really dig the EVIL DEAD-style one!) 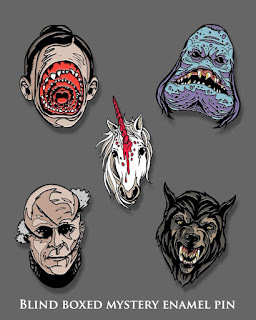 PLUS you can order a enamel pin "Blind Box" and get one of five awesome CABIN IN THE WOODS-themed pins: Merman, Unicorn (with bloody horn), Hell Lord, Wolfman, and Sugar Plum Fairy! The tees are $27 and the pins are going for $15! CLICK HERE to order now! 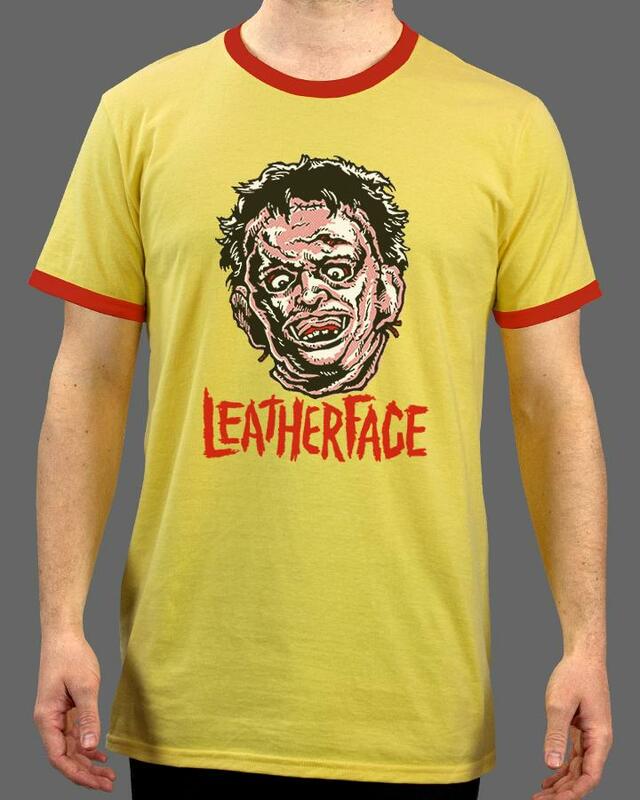 On Wednesday, June 20th, Fright-Rags will be unveiling an all new t-shirt (and enamel pin) collection based upon our ole pal Leatherface! Featuring FIVE new tee designs, plus FOUR new pins, including a "Dancing Leatherface" Action Pin! Prices have yet to be announced and the sale link won't be up until 10 AM Wednesday, so stay tuned for further updates! On June 27th, Fright-Rags unleashes their all-new collection of tees and pins devoted to arguably the greatest modern werewolf film of all time! 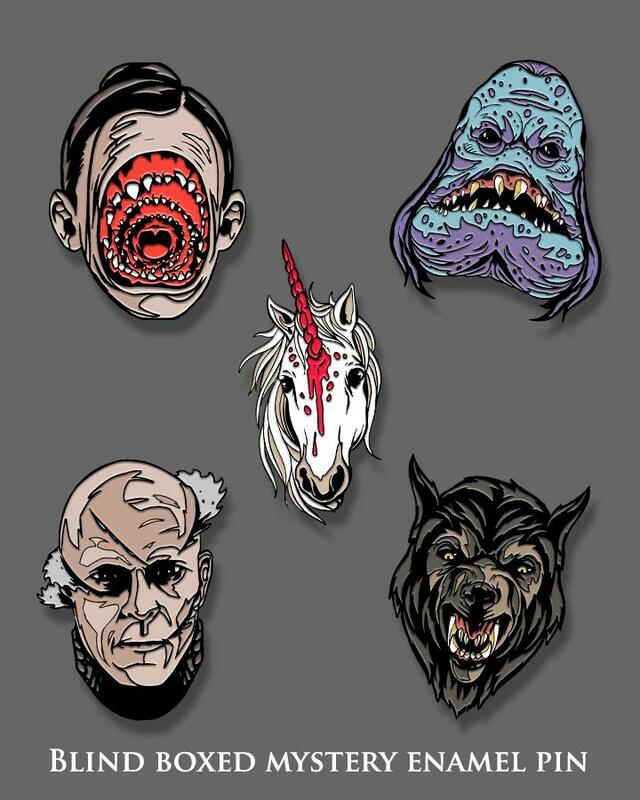 You will have FOUR beautiful tees and FOUR cool enamel pins to choose from, including a "Transformation" motion pin! As is the case with the TCM Collection, prices have yet to be announced, and sale links are not yet live! Stay tuned! 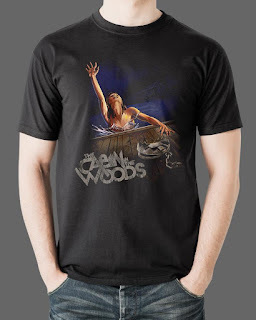 Just in time for Father's Day comes a long out of print t-shirt design for CREEPSHOW (naturally) based upon the Father's Day segment of that awesome anthology! This Classick tee will cost $18, and will be a pre-order only! This shirt is available for THREE DAYS ONLY starting NOW and ending on Monday, June 18 at 10:00 AM EST! You can pick it up in regular black (men's and women's) tee, tank top, or spiffy baseball tee (which is $28)! CLICK HERE to secure yours now! 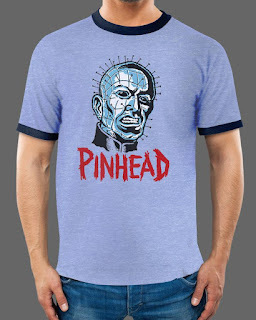 Another classic shirt gets resurrected for THREE DAYS ONLY! From June 29th, until July 2nd, pick up this long lost Fright-Rags design which perfectly captures the tone of Dan O'Bannon's awesome "zomb-edy" THE RETURN OF THE LIVING DEAD! 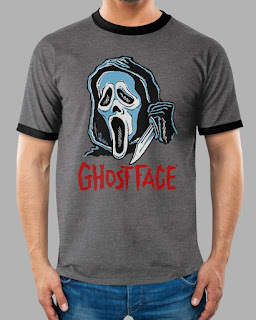 When the sale link goes live for this shirt, it will be posted HERE! Don't know how this shirt escaped me Vault Dwellers! Created by artist Christopher Franchi, this Sam Adam's Lager parody tee is all sorts of awesome! I'd love to wear this out to a bar and shout out "SIX TIMES! SIX TIMES I DID SHOTS WITH HIM! AND HE STUMBLED AWAY! A DRUNK HAS COME TO YOUR LITTLE TOWN SHERIFF!" 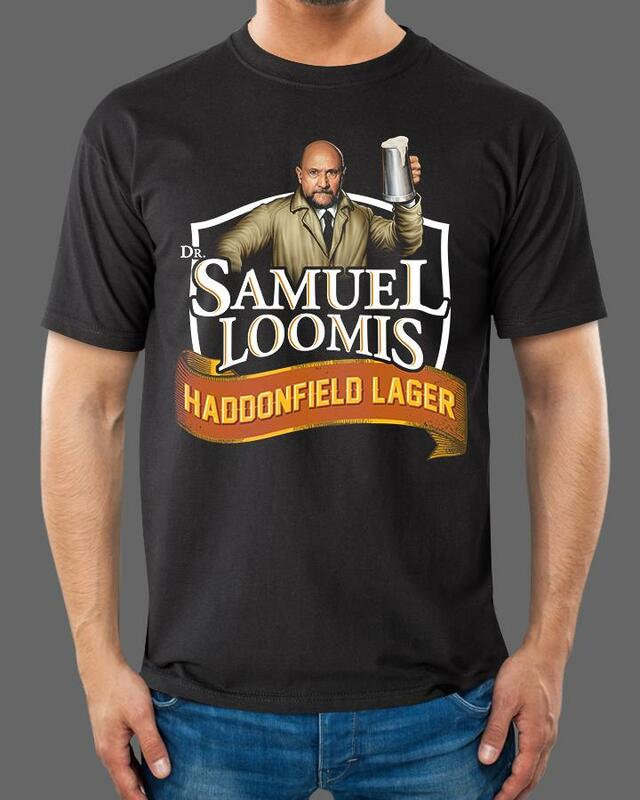 Fright-Rags' Sam Loomis Lager tee comes in all sizes (for men and women) and costs $27.00! CLICK HERE to order yours now! That's all for the moment Vault Dwellers, but stay tuned for more updates because Fright-Rags is always cooking up something awesome for us Horror fans!